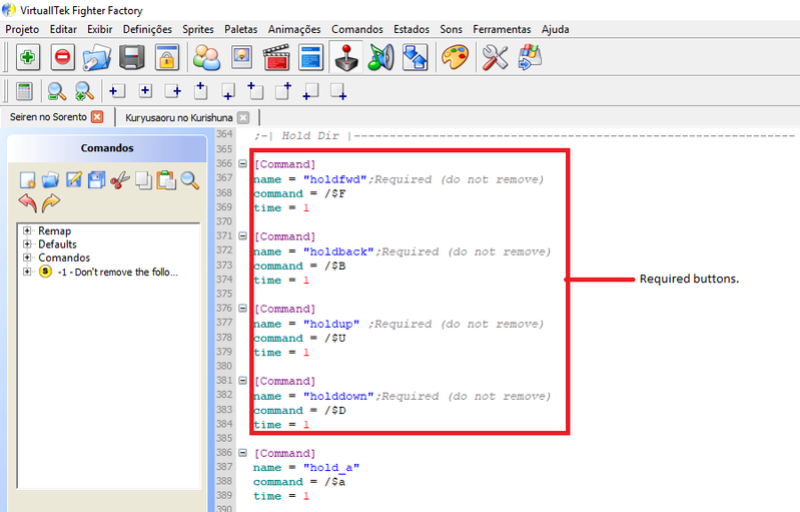 Hello again, finally your friend Orion understood the functionality of the main codes, to do so as planned. so let's go to the most anticipated tutorial. before you start spending your time doing this, be sure that the char in question is pixilated appropriately. Let's start with the def file. Notice that in the def file there should be a line called mugenversion. It is obligatory. It can come in the following ways. Choose which mode you want to program the char. I usually put 1.1, so I can apply all the source codes you want in the char, and you can save the sff on one format lighter. That said let's now go to the cns or st file, where the basic char commands are encoded. So for you do not get lost, write the 12345 group that we are going to work directly above the state -2 group. if your char does not have this group, you will have to create it. Transcribe the entire group below in file cns ou st of your char. Notice the parts in red that I will comment shortly. In this line you establish the distance of the sprite assistant of the exchange of pallets. in chars coded with the localcoord = 320,240, as is ours the distance of -75 is ideal. 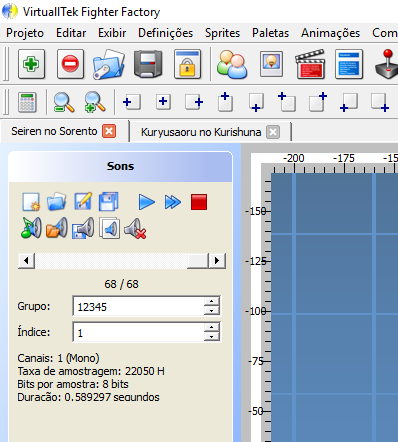 However if you encode it to localcoord = 640,480, you can double the distance, this is -150. 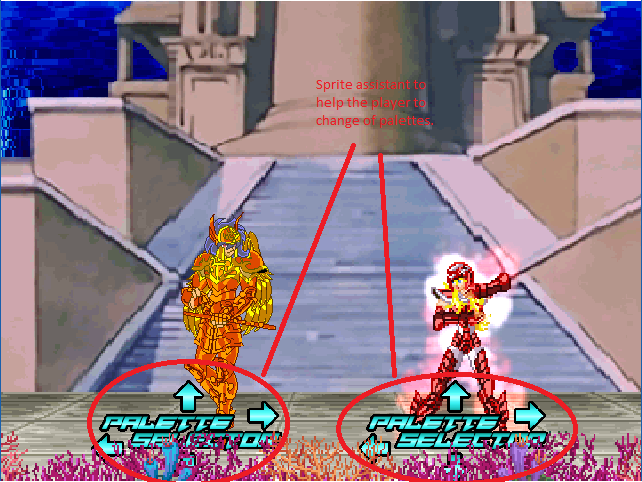 Thus, the sprite assistant of player 1 will not touch player 2. In the red part you define the number of palettes the char has. I usually work with 12, but it is possible to work with more. however, the Remappal code only holds the beginning of the round for a maximum of 30 seconds, after the char completes its intros. It is therefore not feasible to make more than 30 palettes. 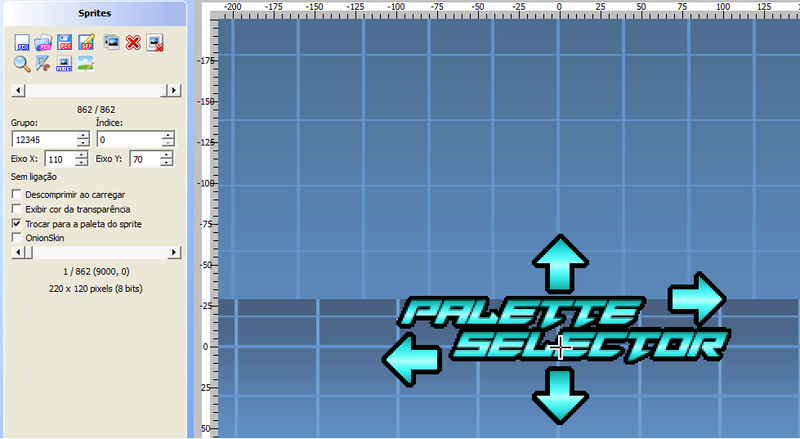 In the red part, enter the result of the subtraction of the number of palettes -1. Thus, you prevent the mugen from reading the first palettes 2 times. If the char has 12 palettes, put 11. If you have 30, 29. And so on. You noticed that the code references a bunch of codes. Leave them for now, let's talk about them when we approach the CMD part. For the hour, type below of the last line of group 12345, the group written below. text = "var(10) = %d damage dampen = %f"
Ready! We've finished the main part of the programming. Let's go to the common states. Go to group 5900, delete everything and transcribe the codes below. reference to the animation number of the palette exchange assistant sprite. This number is relative to the char's Intro in the second round. Note which group was in the previous programming and write the number correctly. If the character does not use Intro in the 2 round, enter the number 0. Let's go to the cmd check if some mandatory commands exist in the char. The first group is relative to the attack keys. 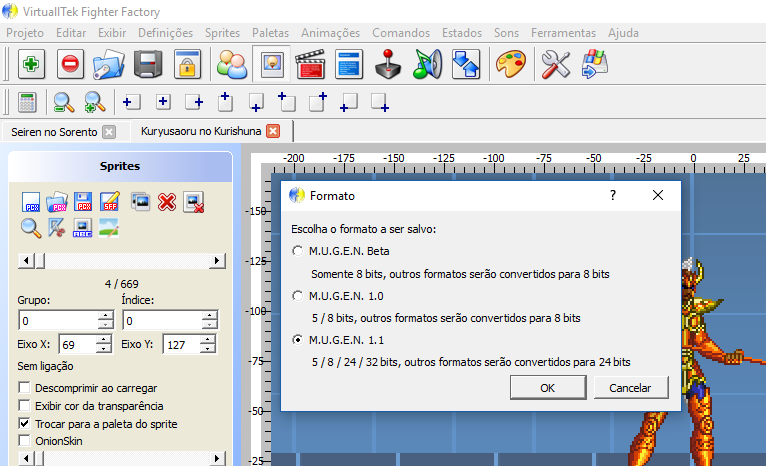 Now we are going to the compulsory buttons of the directional keys. With that we complete the whole programming part. Let's now go to the sff file. List the name of the group as in the above transcript, as well as the position of the X and Y axes. Create a new frame with the specifications shown in the image. That is, animation number 12345, group name 12345, among other things. Go back to the settings. If your sff from your char is still in the winmugen format, now is the time to write all the palettes correctly. Save your progress and close the char in the fighter factory. Then open it again and below the palette lines write the following codes. 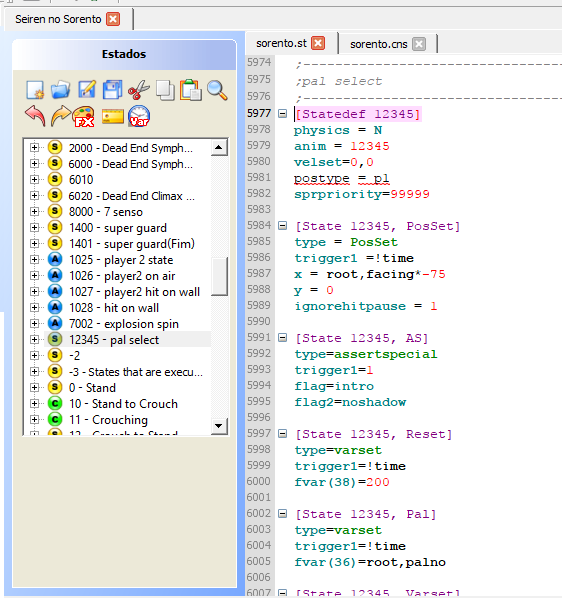 ;Maps character selection buttons to palette numbers. Now we go to the sounds file of the char, the snd. 12345,1 - confirmation of the chosen palette. Save your progress and that's it! The remappal was programmed correctly. However, if you did some undue things in the char during programming, your mugen may close when selecting the character. Relax, it's just a syntax error. It is usually related to adding an extra number that can not be read by a particular code. 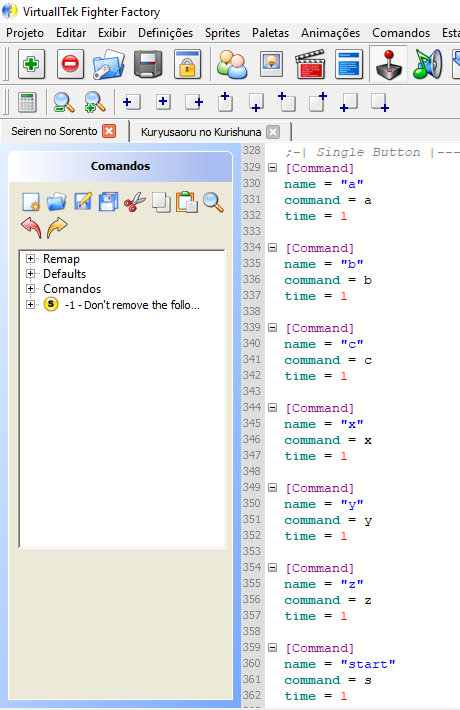 Go to the specified file line and delete the number that is not part of the programming. 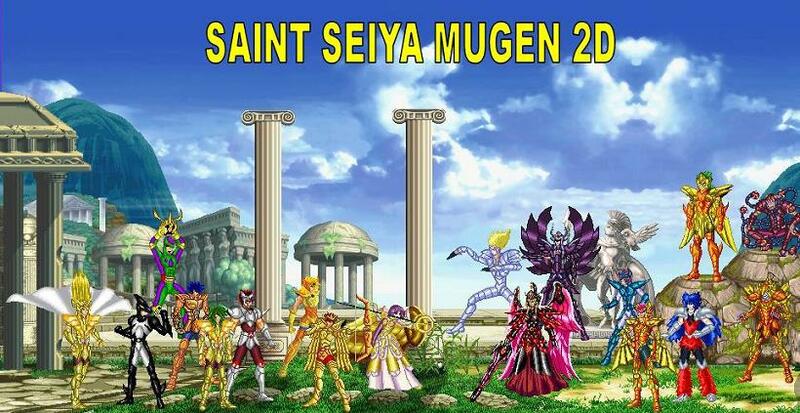 Repeat the process, as often as your mugen ordered. 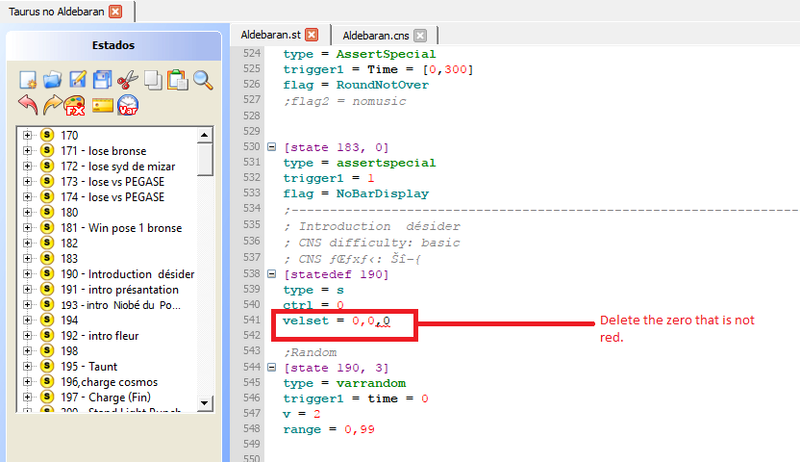 Normally the syntax errors are related to the third zero in the velset code. But in rare cases not. 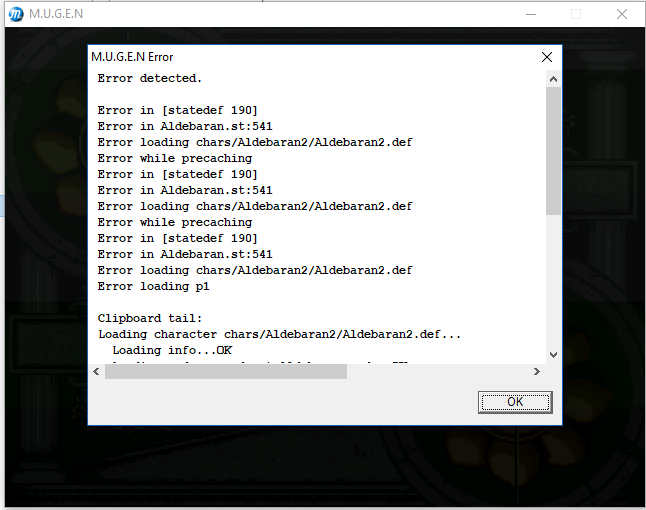 So, delete only what ordered by mugen, as not all black codes are errors. Attention. 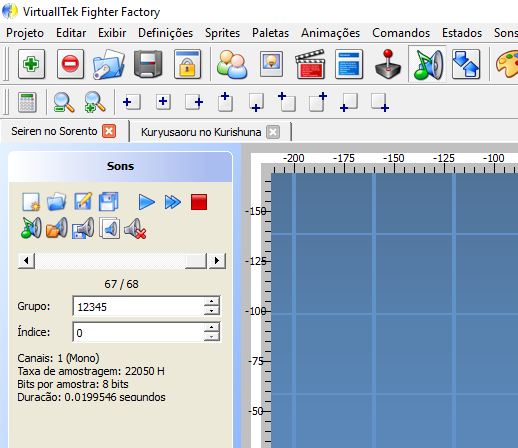 After all this process, your char will be correctly encoded for he version 1.0 or 1.1 of mugen. I hope your friend Orion has helped. The topic title has been changed to something more flashy. O título do tópico foi mudado para algo mais chamativo.